Brian, the bilateral below-the-knee amputee World Record holder by virtue of his 3:06:31 performance at the 2017 Chicago Marathon, already has to get creative with how he trains due to the sensitivity of his prosthetic legs. 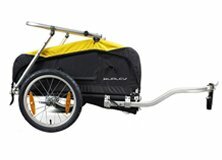 He relies on the ElliptiGO bike to reduce the pounding while continuing to pile on the volume necessary for a marathon. With his leg infection and surgery, he found himself depending even more on cross-training with the GO as he built up to London, which also serves as the invitational-only 2018 World Para Athletics Marathon World Cup. Brian recalled how he was forced to get his unexpected gall bladder surgery, saying, “I woke up on March 20th with a pain in my right upper abdominals. It was not very sore in the morning and I just figured that I strained a muscle because I had raced a half marathon over the weekend. However, the pain got steadily worse throughout the day and I eventually started to have trouble breathing the pain was so intense. Surgery wouldn’t stop him though – Brian got in an ElliptiGO session the day of his surgery, and then was back to heavy ElliptiGO training the day after. Besides the curve ball with the gallbladder surgery, Brian also had his usual leg issues scattered throughout the training cycle. These included skin breakdown, prosthetic issues, and a leg infection. Thanks to the ElliptiGO bike, Brian was able to continue training. “When I was not able to run, I would train very hard, up to three times a day on the ElliptiGO bike hooked up to an indoor trainer. Most weekdays, I was able to get in around 300 mins and on the weekends I could usually bump it up to 400-450 mins. I have to say riding the indoor trainer for that long is probably one of the hardest things I have done in training mentally! By the time I was able to run outside again, the 20-22 mile long runs were a piece of cake by comparison!” Brian shared. Despite the setbacks, Brian said his build up to London was easily his best marathon cycle yet. “I never regressed on my fitness because I was able to attack the cross-training extremely aggressively on the ElliptiGO bike,” said Brian. While Brian shares he is nervous about the London Marathon because the amputees start an hour before the rest of the waves – meaning he’ll be running with few people or even alone – he believes his long, grueling sessions on the ElliptiGO bike will help. “I think all the hours spent on the indoor trainer have helped give me a mental edge!” he said. 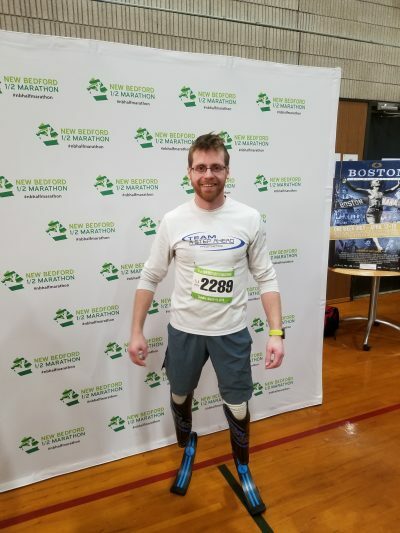 That, backed with the confidence gained from notching a half marathon PR of 1:20:21 set at the hilly New Bedford Marathon in March, shows that Brian is ready to race. The London Marathon will take place Sunday, April 22. ElliptiGO wishes Brian good luck!